Believe it or not but the famous restaurant traditionally known for its Frozen Hot Chocolate is teaming with Ripley's New York City for a creepy sweet Halloween sundae. Dessert emporium Serendipity 3 has joined with Ripley’s Believe It or Not! 42nd Street Odditorium in Times Square for the Ghoulicious and Skull-tastic Sundae. 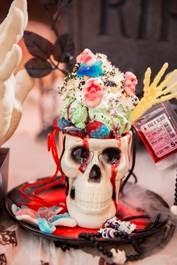 The $20 dish comes in a collectible skull cup and boasts three scoops of ice cream, hot fudge, "blood red" raspberry sauce and is topped with -- according to a press release -- "goo-filled gummy brains and bugs, a mountain of sugar-blackened whipped cream, and hauntingly sprinkled with candy blood-filled skull gummies." There will also be a bone lollipop, sour gummy spider and candy blood bag thrown into the mix. They even throw in a take-home jar of Serendipity's "Famous Hot Fudge Sauce." Available from October 22-31, the sundae will allow the adventurous eater to received a buy one, get one free admission to Ripley's at West 42nd Street. And what better way to digest a massively sweet dessert than to check out exhibits that include vampire killing kits, live cockroaches, to mummies and "the largest collection of real human shrunken heads"?